Pasteur Lappe - Na Man Pass Man. Vinyl LP. Bleep. 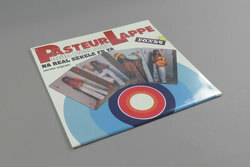 Africa Seven continue on a roll with this Pateur Lappe reissue, coming straight after their amazing and over-looked Manu Dibango Ceddo soundtrack. Much lauded and top of many a DJ’s want list for some time now, these classic afro cosmic jams are available once again. Come on, any album that opens with a cut like ‘Na Real Sekele Fo' Ya’ is just bound to be wonderful!